Booking a holiday used to be easy, kind of expensive and occasionally disappointing: you'd spend hours poring over brochures before popping to the travel agent and booking a fortnight in what inevitably turned out to be a building site halfway up a volcano. Now we have access to the kind of information holidaymakers of yesteryear could only dream of. We can find out what many of brochures don't to tell us, as well as the best time to hit the buffet; how to shave hundreds, or even thousands, of pounds off the price of hotels, car hire and flights; and how to find the best attractions, exhibitions and eateries in places we've never been to before. A few well-chosen vacation-planning apps can make sure your holiday memories are happy rather than horrible. Some apps will help you find the cheapest deals or advise you on the best days to fly. Others can help you find the perfect place with the help of hundreds of other holidaymakers' honest opinions and top tips - some apps will even make sure you don't forget to pack your pants. Whether you're a creature of habit or a fearless explorer - and whether your holiday's a budget break or an expensive extravaganza - the right apps can make sure you don't pay more than you need to while helping you find the best places to stay, the most interesting places to visit and the best times to go. They can even help you learn the lingo and find your way around when you get there. So grab your bucket and spade, and discover how you too can plan an app-y holiday with these top holiday planning apps for iOS. Kayak is a kind of Swiss Army Knife for travelling: it enables you to search for the best and/or cheapest flights, hotel rooms and car hire deals, and it has a handy Price Alerts feature to let you know if prices go up or down. It knows about add-on fees such as airport charges and hotel taxes, and you can even book everything from within the app. That last bit is how Kayak makes its money: it gets paid for referring people. It's a very good app - especially if you're planning to visit the US - but it isn't perfect: for example, if you search for flights from Glasgow to Faro, it suggests British Airways via Heathrow without letting you know that, if you go a few days later, EasyJet has direct flights for one-fifth of the cost. Kayak does know about those flights, but it doesn't tell you about them because they aren't on the dates you specified. It's definitely worth trying a few different date ranges to see what difference it makes. Kayak comes in two versions: the standard app (free) and Kayak Pro (69p). There's hardly any difference between the two versions bar airport terminal maps - which Pro users get and free users don't. Everything else is the same, so whichever version you go for, you're getting a really handy travel app. 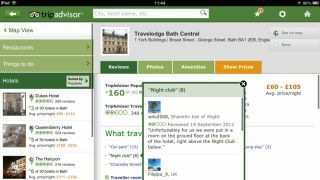 The main draw with TripAdvisor isn't the booking engine or the hotel prices (although TripAdvisor is a good deal finder); it's the user reviews. We've used the TripAdvisor website and app for years, and despite the odd bit of obvious fakery - 'this run-down hotel is the best hotel in the world and I am not the owner in disguise, honestly, I'm not!' - it's saved us from booking the kind of holiday you remember for all the wrong reasons.